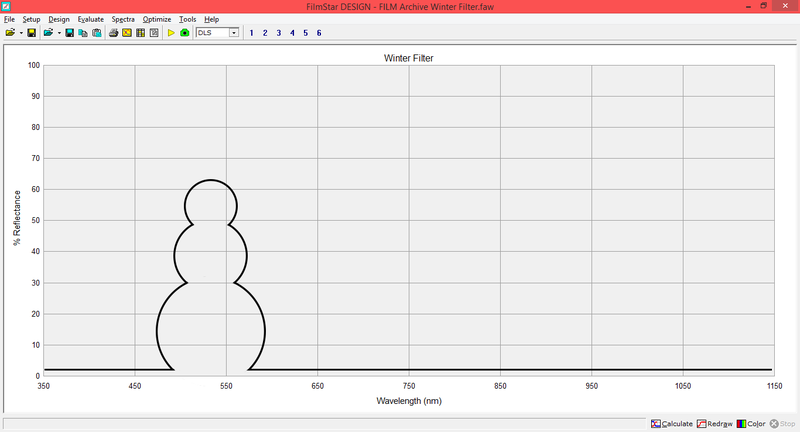 Coaters Tech has developed what I like to call a Winter Filter®. An unthermal coating. Practical uses for this filter are many. But making it requires skill and ingenuity. Only the best coating designers using unique materials and a complete understanding of those material properties will be able to design this coating. Only the best coaters will be able to deposit this filter. Constant monitoring of coating parameters is a must. Deposition temperature cannot exceed -6°C. The substrate is a very clean lawn. Preferably short grass although it will work with grass as long as 5.0cm. No leaves or twigs can be on the lawn when preparing it for coating. Any leaves or twigs will cause defects and dislocations in the crystal structure. Material selection for the coating comprises of several crystal morphologies. From big and fluffy to small, round, dense pellets. I was able to use only 3 different types to make this coating. Production of this filter gets easier the further north your lab is located. But not too far north. Too far north and adhesion starts to become a problem. What applications do you think you could you use this filter for? Coaters Tech clients include both precision optics labs and ophthalmics labs. I've worked in both industries extensively. Every once in awhile I am asked what the difference between the two are. Both use the same materials for coating. TiO2, SiO2, ITO, Al2O3, etc. Both require a high degree of precision and engineering. Both conform to strict optical performance parameters. Both go through stringent quality testing. Hardness, abrasion, environmental testing, etc. The difference? No one buys a $300 camera lens and tosses it on the coffee table or sofa where it gets abused and maybe even put in the baby's mouth. 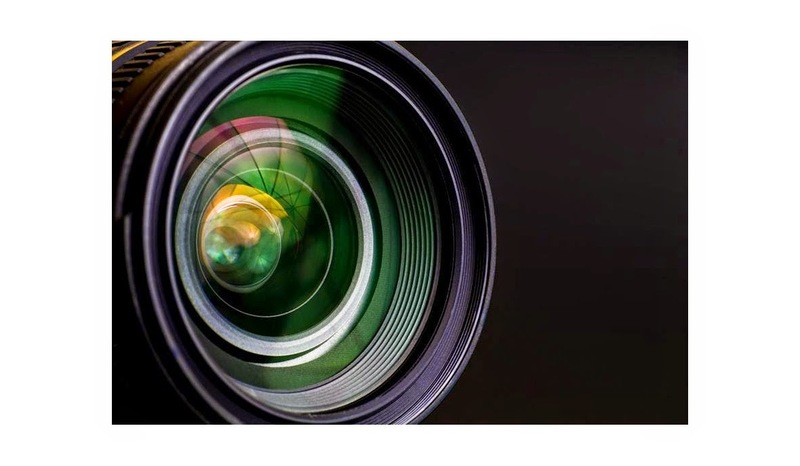 You wouldn't put this $300 camera lens on the sofa. Coating ophthalmics is a difficult business. The same equipment and materials are used for the coatings but eye glasses are taken for granted. A $500+ pair of glasses is usually taken care of for a couple of months but is then left on the front seat of the car where they may get sat on. 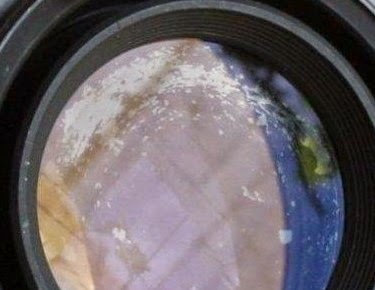 Can you imagine doing that with a new camera lens? Designing thin films is engineering an optical interference matrix. Phase shift at an interface produces interference. At the air to substrate interface and the layer to layer interface a phase shift takes place. When it comes down to it it's as simple as that and you should start to think of your designs as such. I've heard many people claim that AR coatings need to have the last deposited layer be a material that is of "low" index. Designation of high or low or medium index is relative. It's relative to the substrate, the medium in which the optical system operates in, and the other material(s) used in the coating. A simple example is a single layer AR coating. On glass having an index of 1.9 a single layer of MgF2 will result in near 0%R at the design wavelength (1.38 being very close to the square root of 1.9). On Ge a single layer AR could be made of ZnS having a refractive index of 2.2 resulting in a reflection of ~1.3%R (2.2 being close to the square root of 4). The refractive index of ZnS is much higher than the index of MgF2, but much lower than the refractive index of Ge. Comparing these two simple examples we can see that there is the same phase shift occurring at the air to film interface and the film to substrate interface regardless of the actual refractive index. Now this design may be impractical but it illustrates my point. An AR coating ending in a "high" index layer. But it's important to keep in mind that the phase shift at the air to film interface is going to be the same no matter what the last deposited layer is (the medium to film boundary layer). The other layers in this multi-layer example are the rest of the optical interference matrix engineered to result in low reflection at the desired wavelength(s). Looking at your design as an optical interference matrix this way increases your choices of materials. You can start to use harder / environmentally resistant materials as boundary layers, a third material to induce a phase shift change in the matrix at some point in your multi-layer, or choosing materials where equipment or deposition methods may be a limiting factor. To see more about this and more examples watch Episode 9 of Coaters Tech videos. Material set up is probably the most important thing you can do for your process to run smoothly. Everything about your deposition will derive from it. I was asked to characterize a coating chamber with materials that were already in place. 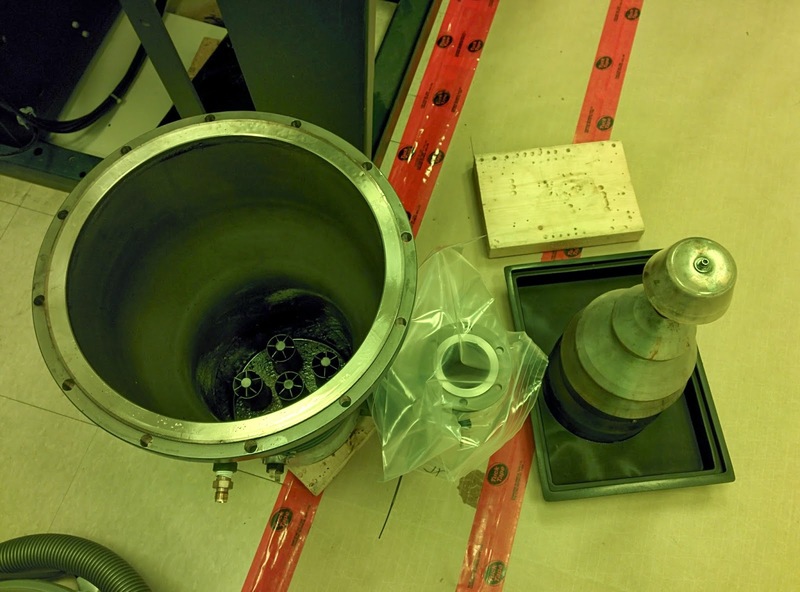 The materials had been premelted in the electron gun prior to my arrival. I started with the easy stuff first and everything was going well until I came to the Ta2O5. I started evaporation manually to set power for soak and rate parameters. 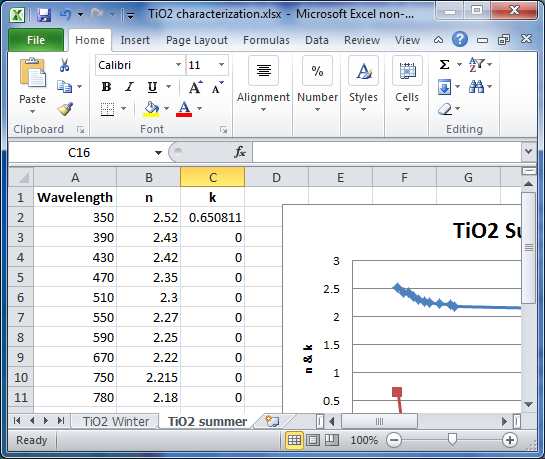 I set the initial O2 bleed based on rate and the size of the coating chamber. But when I ran an automatic process for a Ta2O5 layer to find the tooling factor and index, I saw some rate and pressure fluctuations that indicated a problem with the material set up. I opened the chamber and removed the boule of Ta2O5 to find it hadn't been premelted thoroughly. 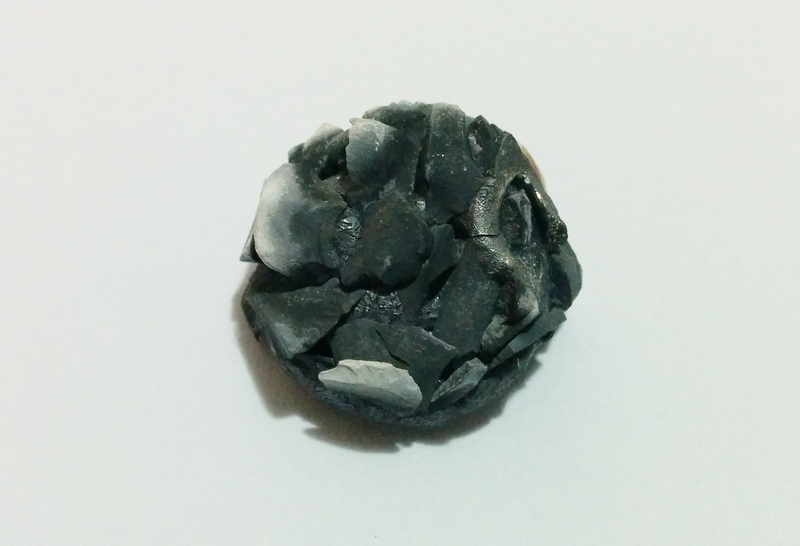 The crucible was filled with Ta2O5 tablets and the top was melted leaving voids beneath the melted surface that is exposed to the vacuum where evaporation occurs. If your material isn't premelted into a solid boule prior to evaporation the problems that will arise include inconsistent rate, spitting, inconsistent refractive index of deposited film, and inconsistent oxidation of deposited film. And of course, bad coatings - performance and quality. Make sure the materials you start with are well prepared and your films will be well deposited. Having worked in the coating lab for many years when I get together with other coaters there's always some good stories to tell. There's the obvious; forgot to put the shutter in, but have you ever forgotten to actually put the parts in? I did a full 3 hour deposition once and when I was done I turned to make room on the flow bench and son of a...! The optics I was supposed to have just coated were still sitting tooled up ready to go in the chamber! I had to stay late without booking the OT to get them coated like I was supposed to. I once lobbied hard to use a different material for a prototype. I gave every good reason to set up and characterize the material in the chamber and run the tests. I got permission to do so and the results were as I expected and engineering was happy with the results. The day after testing concluded I received the $20K+ single optic to coat for the prototype device. Somewhere in the middle of a long process the new material I had successfully suggested and put into process exploded and spit molten material all over the part. That was not good! The damage to the polished surface was too much to polish out and the part had to be remade. Luckily management was very understanding. But we never used that material again. Have you ever made a silly mistake? Or a very costly mistake? Let me know. Change the names to protect the innocent or make your tale anonymous if you like. The various deposition acronyms don't really have solid definitions. For example, depending on who you ask you may get different answers as to what the acronym PVD (physical vapour deposition) means and / or the process it refers to. In Episode 3 of Coaters Tech videos I talked about what these definitions mean and defined them. PVD - physical vapour deposition - The process by which a material is vapourized and deposited where the source material and the deposited material are the same in their chemical makeup. In this process there may be dissociation of compounds at the source but upon deposition the dissociated elements recombine to become the same compound as the source material (eg. MgF2, Au). CVD - chemical vapour deposition - The process by which a material is vapourized and deposited where the source material (either through intent or dissociation) and the deposited material are different in their chemical makeup. In this process the source material or the vapourized components of the source material require process gasses to achieve the desired deposited compound (eg. Ti2O3 > TixOy vapour + O2 = TiO2, HfO2 > HfxOy vapour + O2 = HfO2). 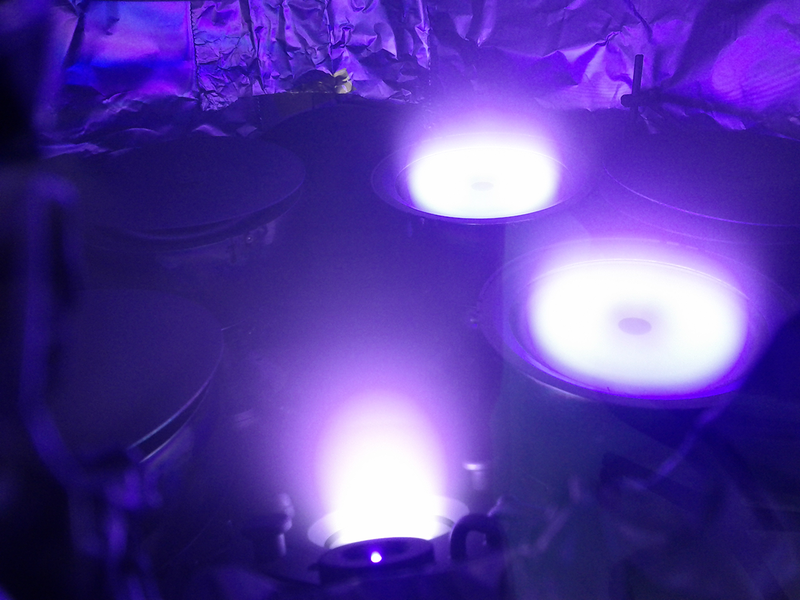 PECVD - plasma enhanced chemical vapour deposition - The process by which a deposited materials' physical properties are manipulated during deposition with the bombardment of plasma (accelerated charged particles) (eg. deposited material density). PACVD - plasma activated chemical vapour deposition - The process by which a material is vapourized and deposited where the source material and the deposited material are different in their chemical makeup. In this process the vapourized source material requires charged process gasses to interact with chemically in order to achieve the desired deposited compound (eg. Ti + N+ = TiN). The ionized process gas is required to achieve the desired deposited compound. What do you think? How do you define the various deposition acronyms? What are some other deposition technique acronyms? Diffusion pump taken apart for repair. I was in the lab with students at Niagara College when the diffusion pump gave out (finally) on the coating chamber beside the one we were using. At the school with students it was an excellent opportunity to show them how to take a high vacuum pump off a coating chamber (letting it cool, venting the pump, draining the water etc.) and see inside the pump. Operation of various pumps is part of the curriculum but getting some hands on with them isn't. This group of student will graduate with a little extra experience. In a production environment a failure like this can prove disastrous. But don't let the same opportunity go to waste with your staff. Most technicians, engineers and management don't get to see the inside of a pump that often, or at all. Labs usually have one or two people that swoop in and take care of the repair and/or replacement of failed equipment. Some contract that kind of work out to companies like Intlvac. When you have a failure of any kind (diff pump, gauge head, water leak in the chamber...) take a moment or two and gather everyone to get a perspective or view of equipment we normally don't get to see. And when it's failed equipment make sure to point out the failure. Broken lab and production equipment is one of those things no one wants but at the same time it can be an invaluable opportunity for you and your staff. P.S. A couple of years ago I found a very small leak in a meissner trap in a Satisloh 1200 DLF. The polycold gas was leaking into the vacuum. After some troubleshooting and realizing what the problem was I was excited. Maybe a little too excited because the GM wasn't pleased with my attitude towards what turned out to be an expensive replacement part. BUT... I got to see what a meissner trap leak looked like while the chamber was trying to pump down to start pressure. I even grabbed a couple of people to come and see. How long will it be before eyeglass lenses are 3D printed? About a year ago I visited 3D printer manufacturer Stratasys to investigate the possibility of printing ophthalmic lenses. What I found was the printing process using materials used to print with can't be made transparent. The best that can be done so far is a translucency not suitable for optical applications. Due to the printing process (melting of polymer threads fed onto the printing stage) the printed structure results in a lot of internal scatter. Here's a good video from Stratasys showing translucent 3D printed parts. If you compare current ophthalmic lens manufacturing to the 3D printing process its easy to see the savings. The most apparent is material waste. An ophthalmic lens blank comes in standard sizes and then has to be generated, polished and edged to fit in a frame. Depending on the prescription and frame size and shape, the material cut away and discarded may be over 80% of its original blank size. Other major savings will include equipment, floor space for that equipment, water, power, and waste removal. These savings are more than significant. 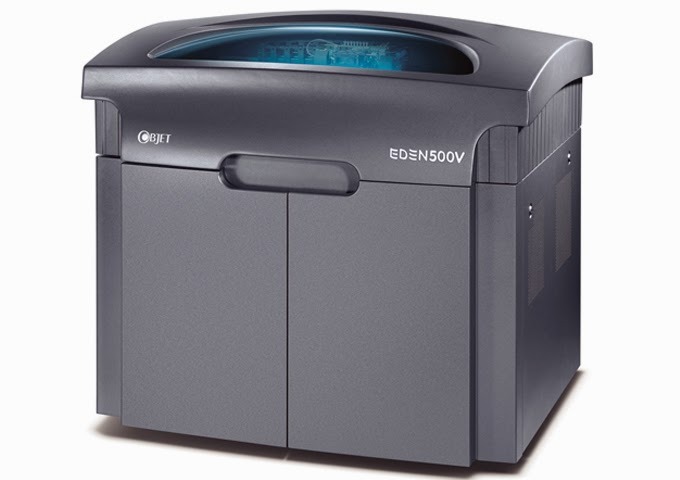 And depending on the size of the printer labs can print several pair at a time. Once 3D printing has advanced to the point where transparent parts can be printed it won't be long before full pairs of glasses are printed, frames and all. Going further still, as the technology progresses glasses can be printed not only with frames but with optical density in a wide range of colours for sunglasses (tints) and possibly with AR coatings. A welcome bonus will be printing lenses in 'tinted' colours will ensure the colour chosen by the customer matches the colour they've actually chosen at the store (I know all too well how frustrating this can be!). As far as AR printing is concerned, currently the tolerancing for 3D printing is on the order of ± 16 microns (for the printer pictured at left). To print AR coatings that tolerancing has to come down to ± 1 nanometer. As I see it the future of ophthalmic lens manufacturing will be a lab with one or more 3D printers connected to the internet taking prescription orders for specific frame styles including tints for sunglasses and fashion. I am happy to say my job as a coating process specialist is safe for the foreseeable future. Coating engineers and coating technicians don't typically mingle with each other. This is a detriment to productivity and efficiency. They are on the same team and their goals are the same. Most coating engineers are university graduates with Masters and PhD's. With an intimate understanding of physics, wave theory and quantum electrodynamics, engineers bring high value to any company designing coatings that make optical devices work. When it comes down to it, without coatings optical devices would be useless. But with little experience actually depositing thin films using your equipment in your lab, it's essential that engineers spend time in your lab. 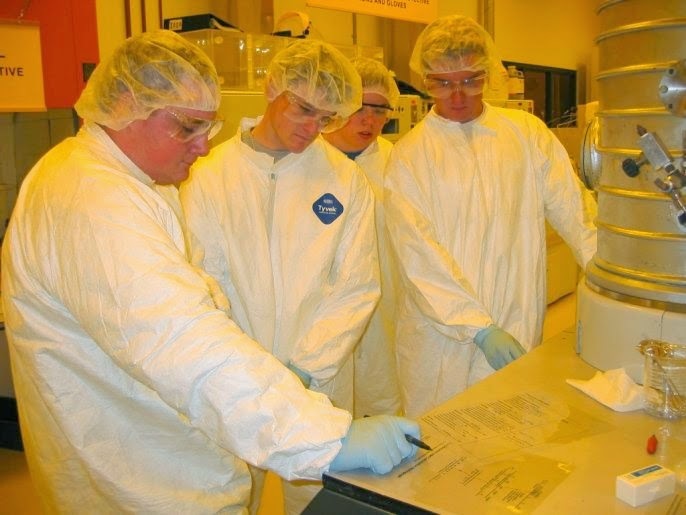 Most coating technicians start working in your lab with no thin film experience at all. It's always a struggle to hire a new coating technician. Usually a new coating technician is new to the technology, or at least new to your equipment. There's a steep learning curve during their training. It's inevitable that new techs learn the hard way - by making mistakes (I know I did). Only with the passing of time and that hard earned experience do techs become familiar with equipment and materials that may be new to them. And which processes do what for your products. With the above two statements being the common truth you can minimize mistakes and inefficiencies by introducing your engineers to your technicians. Engineers should talk to techs about the equipment they use and techs should find out how and why a particular coating design is being implemented. If engineers are familiar with your coating chambers and their individual "personalities" (see the Chamber Characterization post) they will become more efficient designers by knowing what is and isn't practically possible before they start. Have your engineers spend time in the lab learning from your technicians. 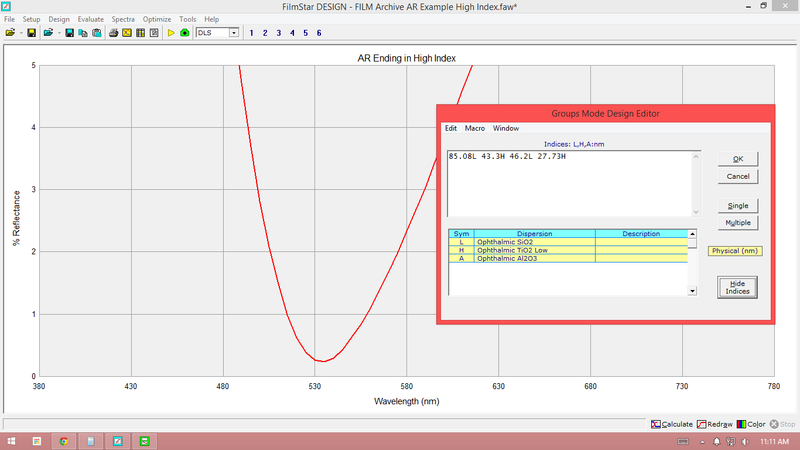 After all, it's usually the engineers that require the characterization data and the techs doing the characterization. If techs have a better understanding of the coatings they are asked to deposit they will be aware of what to look for while operating the coating machines they've become so familiar with. They will become better trouble shooters. They will produce more efficiently. Make sure your techs know how sensitive a design may be and which layers may be the cause of a performance failure. They'll set up the chamber and materials and monitor the deposition process with these details in mind. Bring your entire team together. When you have meetings make sure your engineers and your technicians are side by side and have a complete understanding of the product goals. Eliminate that all too common gap that exists in your team. Get your engineers and techs talking to each other more often. A really good example of thin films process development resulting on NOT fighting environmental effects in application of the product. Most of the time we design and develop thin films to resist the environment (denser films, boundary layers, etc.). This process engineer allows for environmental shifting post process before measuring the final result. The process engineer was having trouble with an ophthalmic AR coating shifting out of colour specifications after the coating was allowed to absorb atmosphere for 24 hours. The engineer designed the coating to shift into spec. An option we too often overlook. Find the thread here on LinkedIn. Characterizing your coating chambers is one of the most important things you can do in your lab. There's an old saying, "A good craftsman never blames his tools". The same goes for coating and your equipment. Know your tools and their capabilities and use them accordingly. Whether you're implementing a new design or process or just maintaining your equipment, knowing your coating chamber's characteristics is key to keeping your processes, new and old, within tolerance. The most important thing is to know your material characteristics. Keep a database on each materials refractive index and physical properties for each coating chamber in your lab. Knowing the characteristics of your materials throughout the day and throughout the year will minimize coating runs that are out of spec and ease the implementation of new coating processes. Characterize your coating chambers once every quarter. Add it to your preventative maintenance program. The optical performance of thin films will change season to season as the environment outside and in your lab change. It should only take a day or two to run all the materials used in a particular chamber and a confirmation coating for verification. It's well worth the time. Characterization of a coating chamber requires more than just knowing the optical and physical properties of the thin films you deposit. You have to know the chamber too. Put your hands on it. Front and back. Top and bottom. Feel for temperature and vibration. Get to know when your equipment isn't running the way it's supposed to. A change in temperature by just a few degrees can change the outcome of your thin films. For example, if you cool your chambers and associated equipment on city water rather than a constant temperature chiller, your processes may change from winter to summer as the water coming in will change by several degrees. Based on the temperature change of your cooling water your processes may need to be changed as the characteristics of the chamber change with temperature. You're the craftsman and your coating chambers are your tools. Know them and their characteristics well so you can use them accordingly, effectively and efficiently. 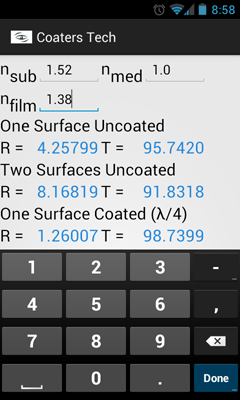 Coaters Tech has a simple app to display reflection and transmission based on substrate, medium and film refractive index data input. It's handy to have especially when you're characterizing your coating chamber. Click to get it on Google Play, or search Google Play Apps for Coaters Tech. To use the app just enter your values for refractive index. If a value is not entered the app defaults that field to a value of 1.